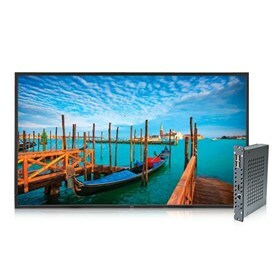 The NEC V552-PC is a bundled solution that includes a 55” V552 display and singleboard computer which is seamlessly integrated utilizing the expansion slot of the display. This built-in functionality allows for a clean, hidden integration. This display has 1920 x 1080 resolution that displays incredibly clear imagery. LED backlighting technology used by this display reduces power consumption and allows for a slimmer cabinet depth. The built-in, low-profile 10W speakers enhances the superior sound quality of the system. The V552-PC features integrated OPS-compliant computer with a 1.6 GHz dual core atom CPU with 32GB solid state drive and Windows 7 embedded. It also has 178° horizontal and vertical viewing angles and brightness of 450cd/m2 with 4000:01 contrast ratio. The NEC V552-PC has many exciting features for users of all types. See the NEC V552-PC gallery images above for more product views. The NEC V552-PC is sold as a Brand New Unopened Item.